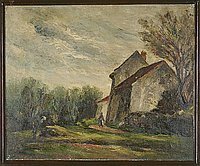 French rural landscape. A red-roofed house with chimney stands at right midground partially obscured by a tall tree and dark brush. A figure in black and blue steps onto a path away from building. The open space of the foreground is broken by a tree and mound on left. Trees border the back under gray skies.